Several years ago I discovered the magical properties of lotion. Up until then, I’d just hop out of the shower, dry and dress and go about my day, leaving a trail of skin flakes that guided me home at the end of the day like a disgusting Hansel and Gretel story. (Too vivid? Sorry.) Then I tried lotion, and was amazed at how much less like lizard skin my skin appeared! Who’da thunk it? And then there were my elbows. The ones that had such dry, scaly, weird bumps that they made my dermatologist think I had scabies. (I didn’t, and he was an idiot. Those bumps come back every winter.) I showed them to my regular, non-idiot doctor and he prescribed a cream with steroids to calm my troubled elbows. There there, elbows. And then….. I tried olive oil. Yep, the stuff you cook with. I’ve been using it instead of all those lotions for about a month now and I am deeming this experiment a success. Straight out of the shower I pour a little in my hand and slather my legs and elbows, then pat my face with the residue left on my hands. While it hasn’t given me baby eyes – my face doesn’t feel wintery-dry-itchy, my legs aren’t shedding, and my elbows are completely non-scabby! It soaks in rather quickly and since it’s not the extra-virgin kind, I don’t think I smell like salad dressing, but then again – my nose isn’t the best smeller. Even if I do, I think I’m sticking with it because this stuff is cheeeeeeeeap! Win! I wonder if the extra virgin stuff would restore my skin AND my innocence? I wonder if other oils would be as successful. Shortening would be less of a spill risk. You could scent it with a few drops of garlic juice. :>) Yeah, I know I’m bad! HAHA! I cracked up at your 1st paragraph! Laughing with you because I can so relate. From one flakey person to another, I’ve had a steroid cream this winter too for my dry skin. Olive Oil you say? I hate feeling oiling as much as feeling dry, but if you endorse it, I’ll try it. PS I didn’t know Paul Simon died. And did you watch 30 Rock last night Lauren. It was written just for yuo. I had a meeting last night so I haven’t watched my stories yet. I can’t wait. There is no way Paul Simon is dead! I would have sensed a disturbance in the force, wouldn’t I? 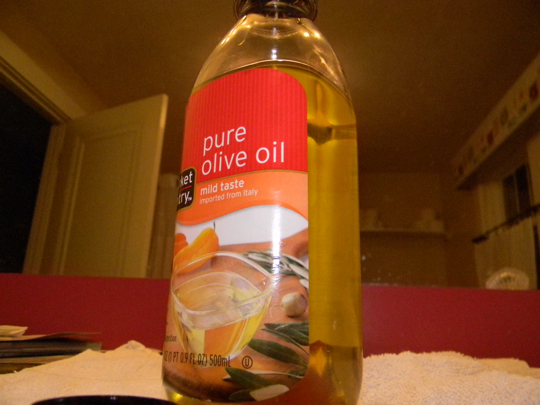 I’ve heard that olive oil does wonders for your skin. I’m trying coconut oil right now, and it’s working. With the cold temps, it’s in a solid state. After a shower, I warm it in my hands, and I smell like I’ve come straight from the Hawaiian Islands. Ooh-la-la. Sorry but right away I thought of this clip. Lauren, make sure you stay out of the sun and out of the kitchen when you are wearing that oil. I haven’t clicked on the link yet, but I’m pretty sure I know what it is, and that’s the first thought that occurred to me as well.